I’m Karen Golden Smith, the other half of Golden Needles. 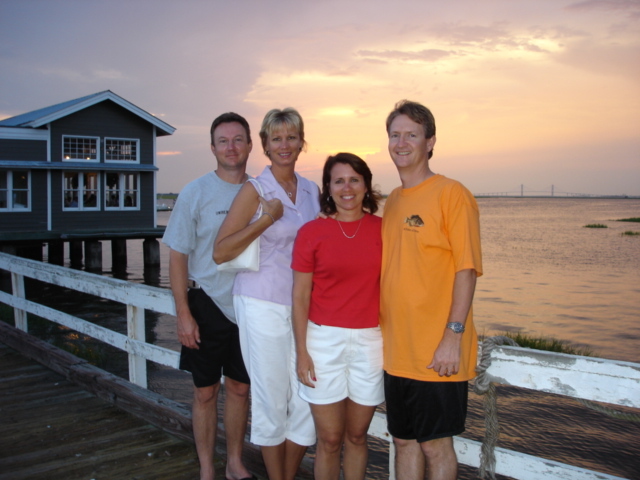 My sister Terri is the one usually doing the blogging since I work full time as a school counselor. I’m counting the days to my retirement. 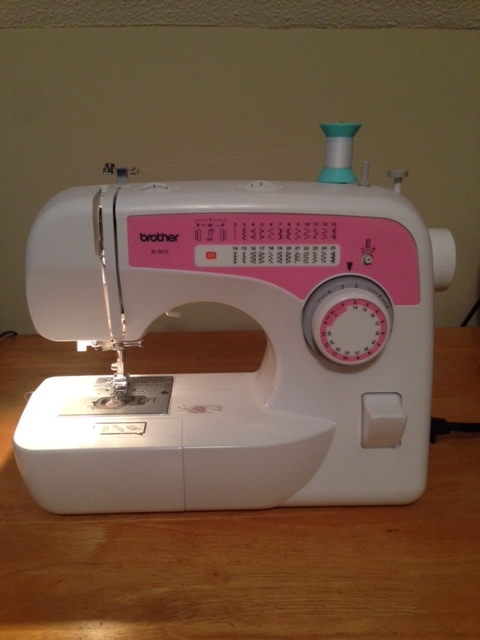 I love my job, but I’m looking forward to putting more time into sewing and teaching sewing. And this is my friend, Jill. 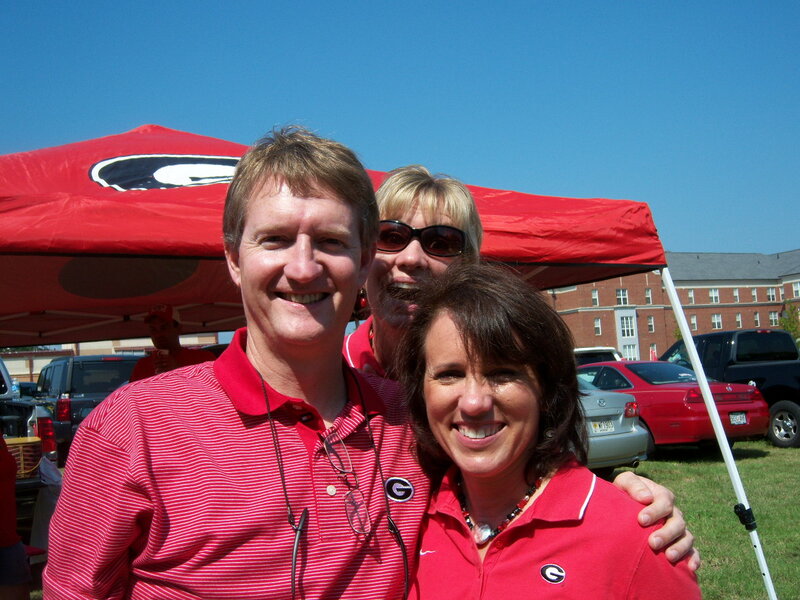 She’s the one photo-bombing the picture of my husband and me. Here’s another one. 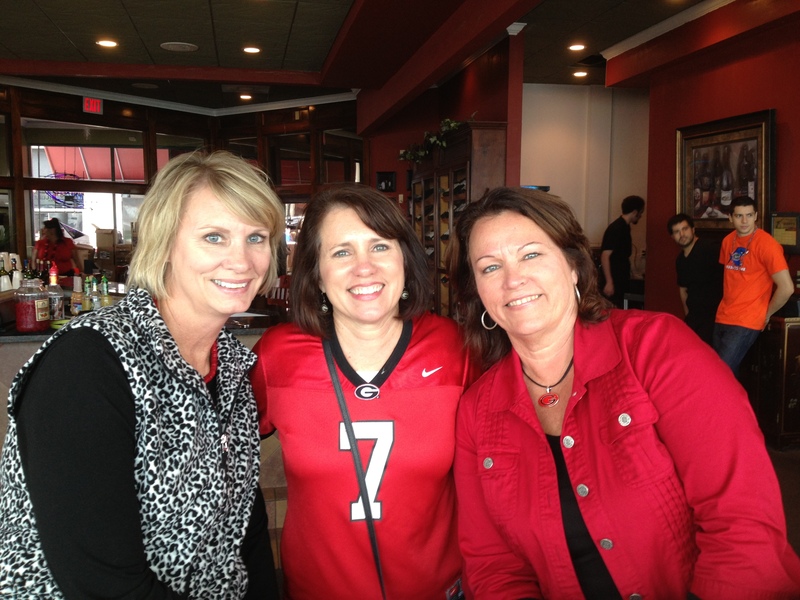 We go to a lot of UGA games together! We both have a lot of red and black in our wardrobe. We have been friends for years and years. 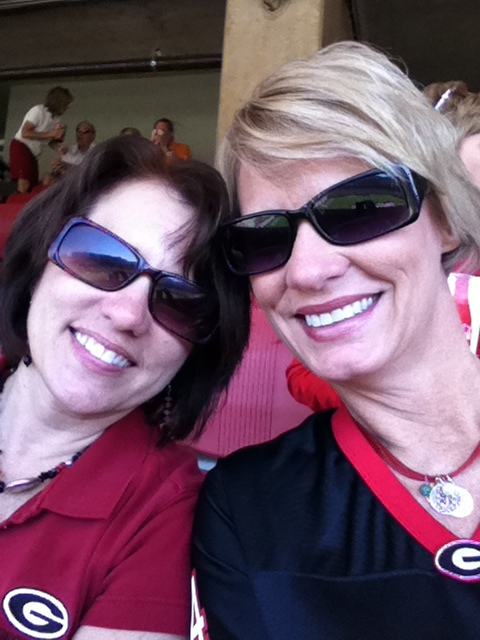 As a matter of fact, we met because our daughters became good friends when they were 12 years old. They are now both 26. So naturally, when she became a great friend of mine, she met Terri. And we all became friends. We even include our husbands and they are friends. We go to church together and, pretty much, live our lives together. When Terri and I began teaching sewing at Golden Needles Studio, she was just being nice when she said she’d sign up for our course. Well, she actually debated with herself a while over the idea of taking the classes, but she wanted to help us out. I think she was worried that we wouldn’t have anybody. She’s our good friend, remember. She said she had a machine a family member gave her in her house somewhere. So, she thought she’d give it a go. Now, it isn’t like Jill needed something to do. She has a full-time job that is a thirty minute ride to get to every day. She has family, and is involved in lots of other activities such as church, socializing, decorating her house and a few crafty things. But she wanted to support her friends in this new endeavor, so she signd up. While Jill was in our classes, she made an apron, a pillow sham with button holes, a throw pillow with a zipper, and pajama pants. And then, she signed up for the Level Two class! She kind of liked this sewing thing. And, she was getting good at it! Not long ago, she and her husband moved into a new house. This new house has a BONUS ROOM! For Jill, it was an easy jump from BONUS ROOM to CRAFT ROOM! She already had a Cricut machine. The wheels were turning in Jill’s creative brain. 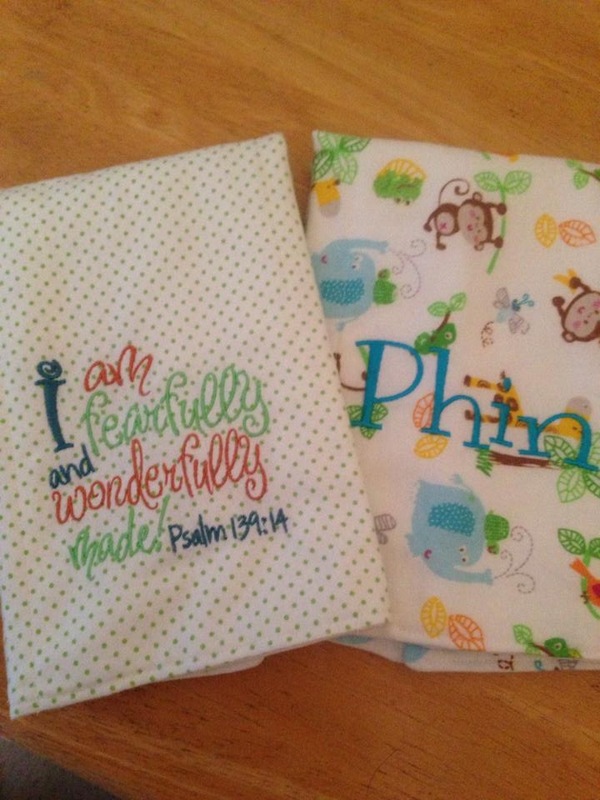 She thought, “hmmm, if I had one of those monogram machines I could make some cute baby items like those burp cloths I see.” So, she ordered an embroidery machine. 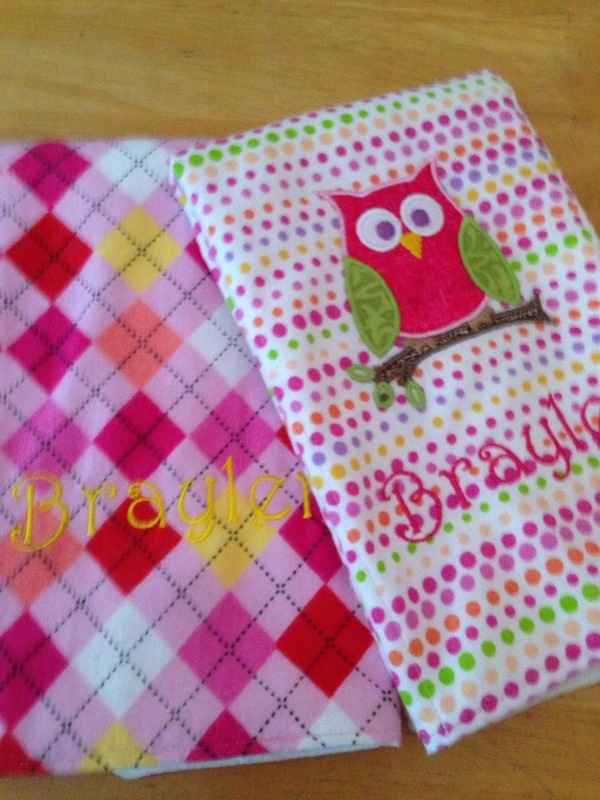 And she made burp cloths and burp cloths and more burp cloths! So, she began advertising them on facebook and they started selling like crazy. And since Jill wants to put a new pool in her new back yard, I’ll bet she is busy figuring out how many burp cloths she needs to make and sell to call in the pool crew. Recently, Jill went to her sister’s house for a sewing weekend. (She is already going to sewing weekends!) 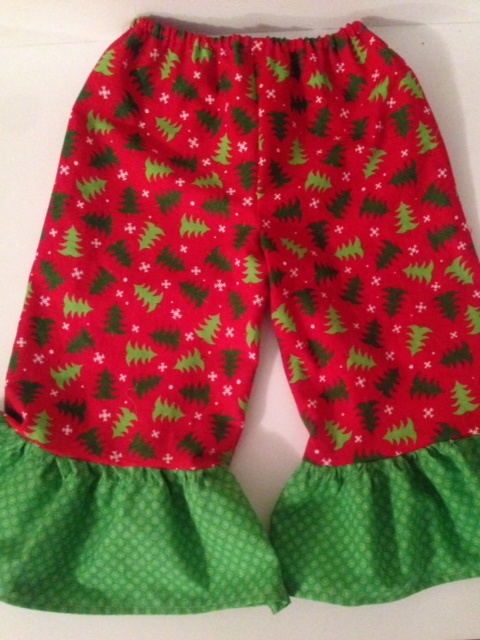 And she learned how to make those ruffled pants for little girls using her sister’s serger. She came home and guess what she ordered? 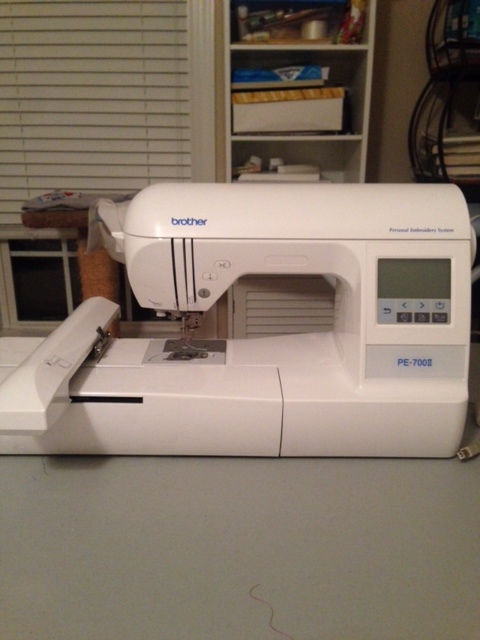 That’s right, a serger has been added to the craft room. These days Jill spends lots of time creating lots of projects! She loves it. And to think she signed up just to help out her old friends! You know, you never know what creativity lies inside of you. This summer, I anticipate Jill’s world will involve lots of sewing. And maybe a little swimming, if those burp cloths keep flying off the shelves. I would live to sign up for the next sewing class. 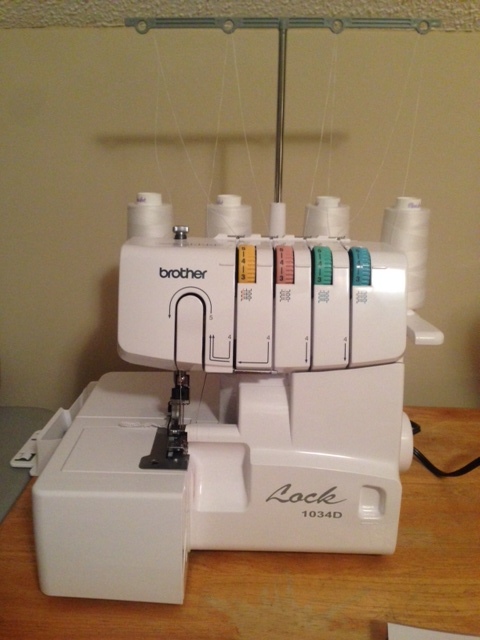 Erin, I just sent you an email with the info on our January 7 class, and the 2014 schedule here at Golden Needles Studio. What is the schedule looking like I am so ready! 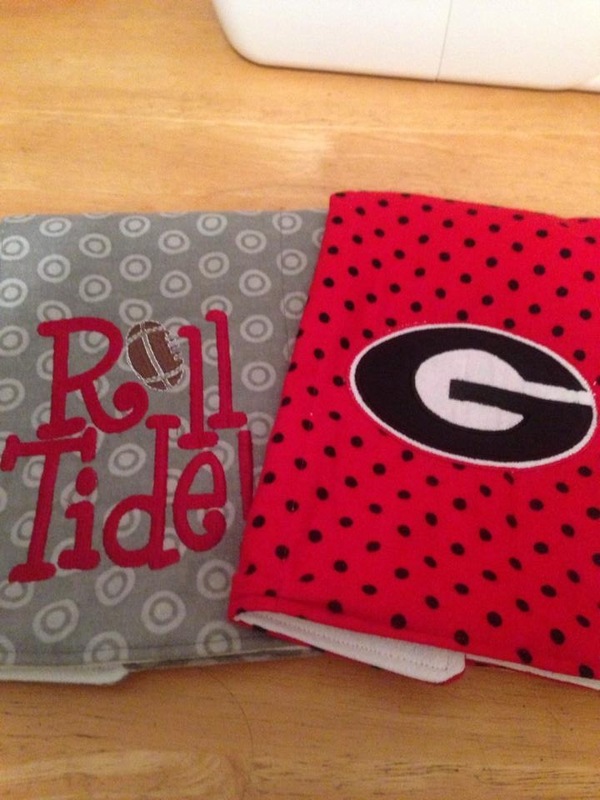 Marion, I just emailed you the 2014 schedule, and info on our January 7 class. Hope you can join us! Where in the world are you located?? Middle GA is a big place! Our studio is located in Warner Robins. 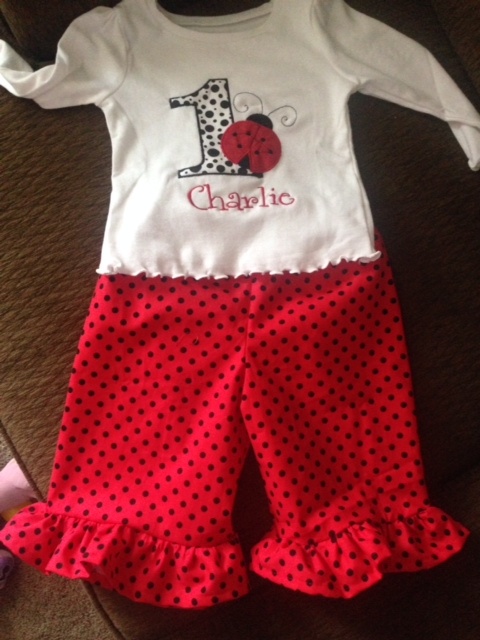 I want to learn how to sew and I am a beginner, when does your next beginner class start I’m looking for a morning class and could you give me the times? Thanks for you interest in our classes! The next classes start September 2. I’ll email you some info!